They say that dancing is combining fun with exercise and friends! 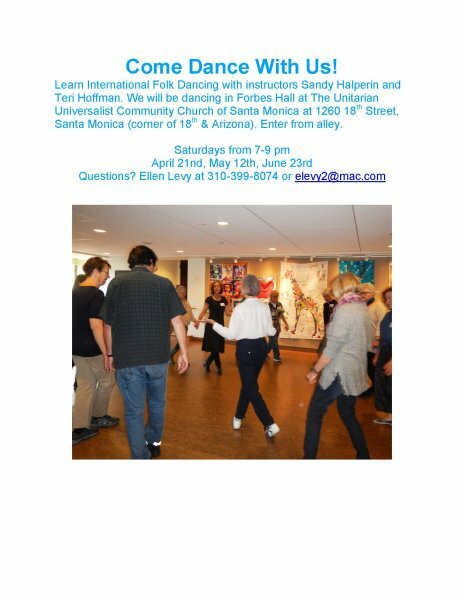 Learn international folk dancing with instructors Sandy Helperin and Teri Hoffman. Folk dancing is for anyone who loves to move to traditional music. New dancers are welcome – there are no partners required. Donations accepted. Repeats every month on the second Saturday until Sat Jan 12 2019 except Sat Jun 09 2018, Sat Aug 11 2018, Sat Sep 08 2018, Sat Nov 10 2018, Sat Dec 08 2018. Also includes Sat Jun 23 2018, Sat Aug 25 2018, Sat Sep 22 2018, Sat Nov 03 2018.